These Pacific National-operated specimens show three styles of diesel locomotive body: box cab (rear), hood unit (center) and cab unit (front). The InterCity 125, the current confirmed record holder as the fastest diesel-powered train at 148 mph (238 km/h); is made up of two power cars, one at each end of a fixed formation of carriages; capable of 125 mph (201 km/h) in regular service. 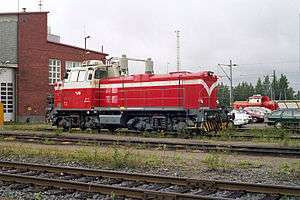 Twin-section diesel locomotive 2M62M-1198 (rebuilt with CAT engines), near Kyviškės, Lithuania. Early internal combustion engine-powered locomotives and railmotors used gasoline as their fuel. Soon after Dr. Rudolf Diesel patented his first compression ignition engine in 1892, it was considered for railway propulsion. Progress was slow, however, as several problems had to be overcome. Steady improvements in diesel design (many developed by Sulzer Ltd. of Switzerland, with whom Dr. Diesel was associated for a time) gradually reduced its physical size and improved its power-to-weight ratio to a point where one could be mounted in a locomotive. Once the concept of diesel-electric drive was accepted, the pace of development quickened, and by 1925 a small number of diesel locomotives of 600 horsepower were in service in the United States. In 1930, Armstrong Whitworth of the United Kingdom delivered two 1,200 hp locomotives using engines of Sulzer design to Buenos Aires Great Southern Railway of Argentina. By the mid-1950s, with economic recovery from the Second World War, production of diesel locomotives had begun in many countries and the diesel locomotive was on its way to becoming the dominant type of locomotive. It offered greater flexibility and performance than the steam locomotive, as well as substantially lower operating and maintenance costs, other than where electric traction was in use due to policy decisions. Currently, almost all diesel locomotives are diesel-electric, although the diesel-hydraulic type was widely used between the 1950s and 1970s. The Soviet diesel locomotive TEP80-0002 lays claim to the world speed record for a diesel railed vehicle, having reached 271 km/h (168 mph) on 5 October 1993. A WDM-3A diesel locomotive of Indian Railways, used to haul both passenger and freight. A string of four diesel locomotives haul a long freight train in the U.S. state of Washington. Earliest recorded examples of an internal combustion engine for railway use included a prototype designed by William Dent Priestman, which was examined by Sir William Thomson in 1888 who described it as a "[Priestman oil engine] mounted upon a truck which is worked on a temporary line of rails to show the adaptation of a petroleum engine for locomotive purposes.". In 1894, a 20 h.p. two axle machine built by Priestman Brothers was used on the Hull Docks. In 1896 an oil-engined railway locomotive was built for the Royal Arsenal, Woolwich, England, in 1896, using an engine designed by Herbert Akroyd Stuart. It was not, strictly, a diesel because it used a hot bulb engine (also known as a semi-diesel) but it was the precursor of the diesel. Following the expiration of Dr. Rudolf Diesel’s patent in 1912, his engine design was successfully applied to marine propulsion and stationary applications. However, the massiveness and poor power-to-weight ratio of these early engines made them unsuitable for propelling land-based vehicles. Therefore, the engine's potential as a railroad prime mover was not initially recognized. This changed as development reduced the size and weight of the engine. The world’s first diesel-powered locomotive was operated in the summer of 1912 on the Winterthur-Romanshorn Railroad in Switzerland, but was not a commercial success. In 1906, Rudolf Diesel, Adolf Klose and the steam and Diesel engine manufacturer Gebrüder Sulzer founded Diesel-Sulzer-Klose GmbH to manufacture Diesel-powered locomotives. Sulzer had been manufacturing Diesel engines since 1898. The Prussian State Railways ordered a Diesel locomotive from the company in 1909, and after test runs between Winterthur and Romanshorn the Diesel-mechanical locomotive was delivered in Berlin in September 1912. During further test runs in 1913 several problems were found. After the First World War broke out in 1914, all further trials were stopped. The locomotive weight was 95 tonnes and the power was 883 kW with a maximum speed of 100 km/h. Small numbers of prototype diesel locomotives were produced in a number of countries through the mid-1920s. Adolphus Busch purchased the American manufacturing rights for the Diesel engine in 1898 but never applied this new form of power to transportation. He founded the Busch-Sulzer company in 1911. Only limited success was achieved in the early twentieth century with direct-driven gasoline and Diesel powered railcars. General Electric (GE) entered the railcar market in the early twentieth century, as Thomas Edison possessed a patent on the electric locomotive, his design actually being a type of electrically propelled railcar. GE built its first electric locomotive prototype in 1895. However, high electrification costs caused GE to turn its attention to Diesel power to provide electricity for electric railcars. Problems related to co-coordinating the Diesel engine and electric motor were immediately encountered, primarily due to limitations of the Ward Leonard electric elevator drive system that had been chosen. A significant breakthrough occurred in 1914, when Hermann Lemp, a GE electrical engineer, developed and patented a reliable direct current electrical control system (subsequent improvements were also patented by Lemp). Lemp's design used a single lever to control both engine and generator in a coordinated fashion, and was the prototype for all diesel-electric locomotive control systems. In 1917–18, GE produced three experimental diesel-electric locomotives using Lemp's control design, the first known to be built in the United States. Following this development, the 1923 Kaufman Act banned steam locomotives from New York City because of severe pollution problems. The response to this law was to electrify high-traffic rail lines. However, electrification was uneconomical to apply to lower-traffic areas. The first regular use of diesel-electric locomotives was in switching (shunter) applications. General Electric produced several small switching locomotives in the 1930s (the famous "44-tonner" switcher was introduced in 1940) Westinghouse Electric and Baldwin collaborated to build switching locomotives starting in 1929. However, the Great Depression curtailed demand for Westinghouse’s electrical equipment, and they stopped building locomotives internally, opting to supply electrical parts instead. General Electric continued to be interested in developing a practical diesel railway locomotive, and approached Ingersoll-Rand in 1924. The resulting 300 horsepower locomotive was fitted with an electrical generator and traction motors supplied by GE, as well as a form of Lemp's control system, and was delivered in July 1925. This locomotive demonstrated that the diesel-electric power unit could provide many of the benefits of an electric locomotive without the railroad having to bear the sizeable expense of electrification. The unit successfully demonstrated—in switching, road freight and passenger service—on a baker’s dozen of railroads, and became the prototype for 33 units of 600 horsepower AGEIR boxcab switching locomotives built by a consortium of GE, I-R and the American Locomotive Company for several New York City railroads. In June 1925, Baldwin Locomotive Works outshopped a prototype diesel-electric locomotive for "special uses" (such as for runs where water for steam locomotives was scarce) using electrical equipment from Westinghouse Electric Company. Its twin-engine design was not successful, and the unit was scrapped after a short testing and demonstration period. Industry sources were beginning to suggest “the outstanding advantages of this new form of motive power”. In 1929, the Canadian National Railways became the first North American railway to use diesels in mainline service with two units, 9000 and 9001, from Westinghouse. Diesel-electric railroad locomotion entered the American mainstream when the Burlington Railroad and Union Pacific used Diesel "streamliners" to haul passengers, both since 1934. Following the successful 1939 tour of General Motors' EMD's FT demonstrator freight locomotive set, the transition from steam to Diesel power began, the pace substantially quickening in the years following the close of World War II. Fairbanks-Morse developed a unique opposed-piston engine that was used in their locomotives, as well as in submarines. 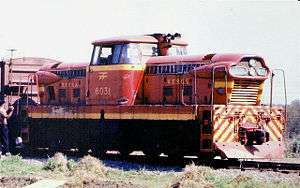 Early diesel-electric locomotives in the United States used direct current (DC) traction motors, but alternating current (AC) motors came into widespread use in the 1990s, starting with the Electro-Motive SD70MAC in 1993 and followed by the General Electric's AC4400CW in 1994 and AC6000CW in 1995. In 1914, world's first functional diesel-electric railcars were produced for the Königlich-Sächsische Staatseisenbahnen (Royal Saxon State Railways) by Waggonfabrik Rastatt with electric equipment from Brown, Boveri & Cie and diesel engines from Swiss Sulzer AG. They were classified as DET 1 and DET 2 (de.wiki). Due to shortage of petrol products during World War I, they remained unused for regular service in Germany. In 1922, they were sold to Swiss Compagnie du Chemin de fer Régional du Val-de-Travers (fr.wiki), where they were used in regular service up to the electrification of the line in 1944. Afterwards, the company kept them in service as boosters till 1965. Fiat claims a first Italian diesel-electric locomotive built in 1922, but little detail is available. A Fiat-TIBB diesel-locomotive "A", of 440CV, is reported to have entered service on the Ferrovie Calabro Lucane in southern Italy in 1926, following trials in 1924-5. In 1935, Krauss-Maffei, MAN and Voith built the first diesel-hydraulic locomotive, called V 140, in Germany. The German railways (DRG) being very pleased with the performance of that engine, diesel-hydraulics became the mainstream in diesel locomotives in Germany. Serial production of diesel locomotives in Germany began after World War II. In many railway stations and industrial compounds, steam shunters had to be kept hot during lots of lazy breaks between scattered short tasks. Therefore, diesel traction became economic for shunting, before it became economic for hauling trains. The construction of diesel shunters began in 1920 in France, in 1925 in Denmark, in 1926 in the Netherlands, and in 1927 in Germany. After few years of testing, hundreds of units were produced within a decade. Diesel-powered or "oil-engined" railcars, generally diesel-mechanical, were developed by various European manufacturers in the 1930s, e.g. by William Beardmore and Company for the Canadian National Railways (the Beardmore Tornado engine was subsequently used in the R101 airship). Some of those series for regional traffic were begun with gasoline motors and then continued with diesel motors, such as Hungarian BCmot (The class code doesn't tell anything but "railmotor with 2nd and 3rd class seats". ), 128 cars built 1926 – 1937, or German Wismar railbuses (57 cars 1932 – 1941). In France, the first diesel railcar was Renault VH, 115 units produced 1933/34. In Italy, after 6 Gasoline cars since 1931, Fiat and Breda built a lot of diesel railmotors, more than 110 from 1933 to 1938 and 390 from 1940 to 1953, Class 772 known as Littorina, and Class ALn 900. In 1945, a batch of 30 Baldwin diesel-electric locomotives, Baldwin 0-6-6-0 1000, was delivered from the United States to the railways of the Soviet Union. In 1947, the London Midland & Scottish Railway introduced the first of a pair of 1,600 hp Co-Co diesel-electric locomotives (later British Rail Class D16/1) for regular use in the United Kingdom, although British manufacturers such as Armstrong Whitworth had been exporting diesel locomotives since 1930. 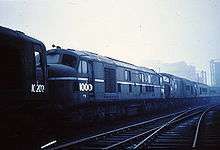 Fleet deliveries to British Railways, of other designs such as Class 20 and Class 31, began in 1957. In Japan, since the 1920s, some petrol-electric railcars were produced. The first diesel-electric traction and the first air-streamed vehicles on Japanese rails were the two DMU3s of class Kiha 43000 (キハ43000系)  Japan's first series of diesel locomotives was class DD50 (国鉄DD50形デ), twin locomotives, developed since 1950 and in service since 1953. Diesel engines slowly eclipsed those powered by steam as the manufacturing and operational efficiencies of the former made them cheaper to own and operate. While initial costs of diesel engines were high, steam locomotives were custom-made for specific railway routes and lines and, as such, economies of scale were difficult to achieve. Though more complex to produce with exacting manufacturing tolerances (1⁄10000-inch (0.0025 mm) for diesel, compared with 1⁄100-inch (0.25 mm) for steam), diesel locomotive parts were more conducive to mass production. While the steam engine manufacturer Baldwin offered almost five hundred steam models in its heyday, EMD offered fewer than ten diesel varieties. 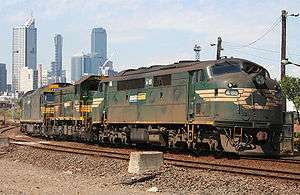 Diesel locomotives offer significant operating advantages over steam locomotives. They can safely be operated by one person, making them ideal for switching/shunting duties in yards (although for safety reasons many main-line diesel locomotives continue to have 2-man crews: an engineer and a conductor/switchman) and the operating environment is much more attractive, being much quieter, fully weatherproof and without the dirt and heat that is an inevitable part of operating a steam locomotive. Diesel locomotives can be worked in multiple with a single crew controlling multiple locomotives throughout a single train—something not practical with steam locomotives. This brought greater efficiencies to the operator, as individual locomotives could be relatively low-powered for use as a single unit on light duties but marshaled together to provide the power needed on a heavy train still under the control of a single crew. With steam traction a single very powerful and expensive locomotive was required for the heaviest trains or the operator resorted to double heading with multiple locomotives and crews, a method which was also expensive and brought with it its own operating difficulties. Diesel engines can be started and stopped almost instantly, meaning that a diesel locomotive has the potential to incur no costs when not being used. However, it is still the practice of large North American railroads to use straight water as a coolant in diesel engines instead of coolants that incorporate anti-freezing properties; this results in diesel locomotives being left idling when parked in cold climates instead of being completely shut down. Still, a diesel engine can be left idling unattended for hours or even days, especially since practically every diesel engine used in locomotives has systems that automatically shut the engine down if problems such as a loss of oil pressure or coolant loss occur. In recent years, automatic start/stop systems such as SmartStart have been adopted, which monitor coolant and engine temperatures. When these temperatures show that the unit is close to having its coolant freeze, the system restarts the diesel engine to warm the coolant and other systems. Steam locomotives, by comparison, require intensive maintenance, lubrication, and cleaning before, during, and after use. Preparing and firing a steam locomotive for use from cold can take many hours, although it may be kept in readiness between uses with a small fire to maintain a slight heat in the boiler, but this requires regular stoking and frequent attention to maintain the level of water in the boiler. This may be necessary to prevent the water in the boiler freezing in cold climates, so long as the water supply itself is not frozen. Moreover, maintenance and operational costs of steam locomotives were much higher than diesel counterparts even though it took diesel locomotives almost 50 years to reach the same power output that steam locomotives could achieve at their technological height. Annual maintenance costs for steam locomotives accounted for 25% of the initial purchase price. Spare parts were cast from wooden masters for specific locomotives. The sheer number of unique steam locomotives meant that there was no feasible way for spare-part inventories to be maintained. With diesel locomotives spare parts could be mass-produced and held in stock ready for use and many parts and sub-assemblies could be standardised across an operator's fleet using different models of locomotive from the same builder. Parts could be interchanged between diesel locomotives of the same or similar design, reducing down-time; for example, a locomotive's faulty prime mover may be removed and quickly replaced with another spare unit, allowing the locomotive to return to service whilst the original prime mover is repaired (and which can in turn be held in reserve to be fitted to another locomotive). Repair or overhaul of the main workings of a steam locomotive required the locomotive to be out of service for as long as it took for the work to be carried out in full. Steam engines also required large quantities of coal and water, which were expensive variable operating costs. Further, the thermal efficiency of steam was considerably less than that of diesel engines. Diesel’s theoretical studies demonstrated potential thermal efficiencies for a compression ignition engine of 36% (compared with 6–10% for steam), and an 1897 one-cylinder prototype operated at a remarkable 26% efficiency. A British Rail Class 03 diesel-mechanical shunter (switcher) with a jackshaft under the cab. A diesel-mechanical locomotive uses a mechanical transmission in a fashion similar to that employed in most road vehicles. This type of transmission is generally limited to low-powered, low speed shunting (switching) locomotives, lightweight multiple units and self-propelled railcars. Diesel-mechanical propulsion is limited by the difficulty of building a reasonably sized transmission capable of coping with the power and torque required to move a heavy train. 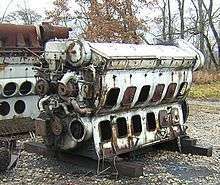 A number of attempts to use diesel-mechanical propulsion in high power applications have been made (e.g., the 1,500 kW (2000 horsepower) British Rail 10100 locomotive), although none have proved successful in the end. For locomotives powered by both external electricity and diesel fuel, see electro-diesel below. For locomotives powered by a combination of diesel or fuel cells and batteries or ultracapacitors, see hybrid locomotive. In a diesel-electric locomotive, the diesel engine drives either an electrical DC generator (generally, less than 3,000 horsepower (2,200 kW) net for traction), or an electrical AC alternator-rectifier (generally 3,000 horsepower (2,200 kW) net or more for traction), the output of which provides power to the traction motors that drive the locomotive. There is no mechanical connection between the diesel engine and the wheels. 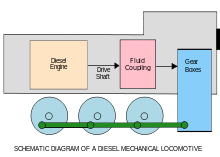 The important components of diesel-electric propulsion are the diesel engine (also known as the prime mover), the main generator/alternator-rectifier, traction motors (usually with four or six axles), and a control system consisting of the engine governor and electrical and/or electronic components, including switchgear, rectifiers and other components, which control or modify the electrical supply to the traction motors. In the most elementary case, the generator may be directly connected to the motors with only very simple switchgear. 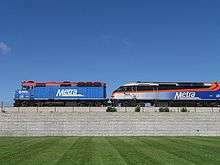 The EMD F40PH (left) and MPI MPXpress-series MP36PH-3S (right) locomotives coupled together by Metra use diesel-electric transmission. 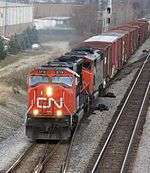 Current North American practice is for four axles for high-speed passenger or "time" freight, or for six axles for lower-speed or "manifest" freight. 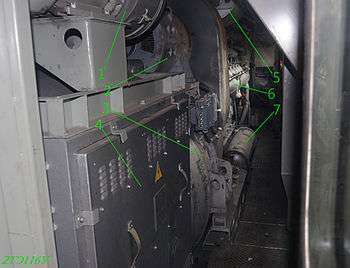 Engineer's controls in a diesel-electric locomotive cab. The lever near bottom-centre is the throttle and the lever visible at bottom left is the automatic brake valve control. A diesel-electric locomotive's power output is independent of road speed, as long as the unit’s generator current and voltage limits are not exceeded. Therefore, the unit's ability to develop tractive effort (also referred to as drawbar pull or tractive force, which is what actually propels the train) will tend to inversely vary with speed within these limits. 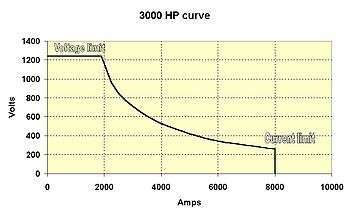 (See power curve below). Maintaining acceptable operating parameters was one of the principal design considerations that had to be solved in early diesel-electric locomotive development and, ultimately, led to the complex control systems in place on modern units. In older locomotives, it was necessary for the engine driver to manually execute transition by use of a separate control. As an aid to performing transition at the right time, the load meter (an indicator that informs the engine driver on how much current is being drawn by the traction motors) was calibrated to indicate at which points forward or backward transition should take place. Automatic transition was subsequently developed to produce better operating efficiency, and to protect the main generator and traction motors from overloading from improper transition. A common option on diesel-electric locomotives is dynamic (rheostatic) braking. Dynamic braking is particularly beneficial when operating in mountainous regions; where there is always the danger of a runaway due to overheated friction brakes during descent (see also comments in the air brake article regarding loss of braking due to improper train handling). In such cases, dynamic brakes are usually applied in conjunction with the air brakes, the combined effect being referred to as blended braking. The use of blended braking can also assist in keeping the slack in a long train stretched as it crests a grade, helping to prevent a "run-in", an abrupt bunching of train slack that can cause a derailment. Blended braking is also commonly used with commuter trains to reduce wear and tear on the mechanical brakes that is a natural result of the numerous stops such trains typically make during a run. These special locomotives can operate as an electric locomotive or as a diesel locomotive. 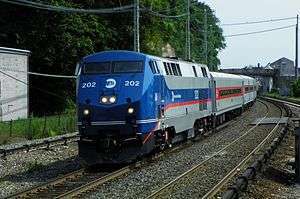 The Long Island Rail Road, Metro-North Railroad and New Jersey Transit Rail Operations operate dual-mode diesel-electric/third-rail (catenary on NJTransit) locomotives between non-electrified territory and New York City because of a local law banning diesel-powered locomotives in Manhattan tunnels. For the same reason, Amtrak operates a fleet of dual-mode locomotives in the New York area. British Rail operated dual diesel-electric/electric locomotives designed to run primarily as electric locomotives with reduced power available when running on diesel power. This allowed railway yards to remain un-electrified, as the third rail power system is extremely hazardous in a yard area. Diesel-hydraulic locomotives use one or more torque converters, in combination with gears, with a mechanical final drive to convey the power from the diesel engine to the wheels. Hydrostatic transmission systems are also used in some rail applications, primarily low speed shunting and rail-maintenance vehicles. Diesel-hydraulic drive is common in multiple units, with various transmission designs used including Voith torque converters, and fluid couplings in combination with mechanical gearing. The majority of British Rail's second generation passenger DMU stock used hydraulic transmission. In the 21st century designs using hydraulic transmission include Bombardier's Turbostar, Talent, RegioSwinger families; diesel engined versions of Siemens's Desiro platform, and the Stadler Regio-Shuttle. 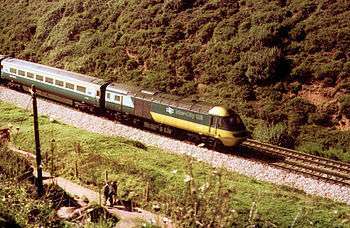 British Rail diesel-hydraulic locomotives: Class 52 "Western", Class 42 "Warship" and Class 35 "Hymek"
Diesel-hydraulic locomotives are less efficient than diesel-electrics. The first-generation BR diesel hydraulics were significantly less efficient (c. 65%) than diesel electrics (c. 80%) — moreover initial versions were found in many countries to be mechanically more complicated and more likely to break down. Hydraulic transmission for locomotives was developed in Germany. There is still debate over the relative merits of hydraulic vs. electrical transmission systems: advantages claimed for hydraulic systems include lower weight, high reliability, and lower capital cost. 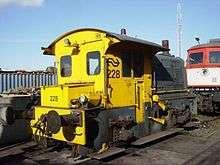 By the 21st century, for diesel locomotive traction worldwide the majority of countries used diesel-electric designs, with diesel hydraulic designs not found in use outside Germany and Japan, and some neighbouring states, where it is used in designs for freight work. In Germany and Finland, diesel-hydraulic systems have achieved high reliability in operation. In the UK the diesel-hydraulic principle gained a poor reputation due to the poor durability and reliability of the Maybach Mekydro hydraulic transmission. Argument continues over the relative reliability of hydraulic systems, with questions over whether data has been manipulated to favour local suppliers over non-German ones. Other main-line locomotives of the post war period included the 1950s GMD GMDH-1 experimental locomotives; the Henschel & Son built South African Class 61-000; in the 1960s Southern Pacific bought 18 Krauss-Maffei KM ML-4000 diesel-hydraulic locomotives. The Denver & Rio Grande Western also bought three, all of which were later sold to SP. In Finland, over 200 Finnish-built VR class Dv12 and Dr14 diesel-hydraulics with Voith transmissions have been continuously used since the early 1960s. All units of Dr14 class and most units of Dv12 class are still in service. VR has abandoned some weak-conditioned units of 2700 series Dv12s. In the 21st century series production standard gauge diesel-hydraulic designs include the Voith Gravita, ordered by Deutsche Bahn, and the Vossloh G2000, G1206 and G1700 designs, all manufactured in Germany for freight use. Hydraulic drive systems using a hydrostatic hydraulic drive system have been applied to rail use. Modern examples included 350 to 750 hp (260 to 560 kW) shunting locomotives by CMI Group (Belgium), 4 to 12 tonne 35 to 58 kW (47 to 78 hp) narrow gauge industrial locomoitves by Atlas Copco subsidiary GIA. Hydrostatic drives are also utilised in railway maintenance machines (tampers, rail grinders). Application of hydrostatic transmissions are generally limited to small shunting locomotives and rail maintenance equipment, as well as being used for non-tractive applications in diesel engines such as drives for traction motor fans. Diesel-electric locomotive built by EMD for service in the UK and continental Europe. The ability to couple diesel-electric locomotives in an MU fashion was first introduced in the EMD FT four-unit demonstrator that toured the United States in 1939. At the time, American railroad work rules required that each operating locomotive in a train had to have on board a full crew. EMD circumvented that requirement by coupling the individual units of the demonstrator with drawbars instead of conventional knuckle couplers and declaring the combination to be a single locomotive. Electrical interconnections were made so one engine driver could operate the entire consist from the head-end unit. Later on, work rules were amended and the semi-permanent coupling of units with drawbars was eliminated in favour of couplers, as servicing had proved to be somewhat cumbersome owing to the total length of the consist (about 200 feet or nearly 61 meters). Occasionally, the second unit may have its prime-mover and traction alternator removed and replaced by concrete and/or steel ballast and the power for traction obtained from the master unit. As a 16-cylinder prime-mover generally weighs in the 36,000-pound (16,000 kg) range, and a 3,000 hp (2,200 kW) traction alternator generally weighs in the 18,000-pound (8,200 kg) range, this would mean that 54,000 lb (24,000 kg) would be needed for ballast. The lights fitted to diesel locomotives vary from country to country. North American locomotives are fitted with two headlights for redundancy and a pair of ditch lights. The latter are fitted low down at the front and are designed to make the locomotive easily visible as it approaches a grade crossing. Older locomotives may be fitted with a Gyralite or Mars Light instead of the ditch lights. Other technologies that are being deployed to reduce locomotive emissions and fuel consumption include "Genset" switching locomotives and hybrid Green Goat designs. Genset locomotives use multiple high-speed diesel engines and generators (generator sets), rather than a single medium-speed diesel engine and a single generator. Green Goats are a type of hybrid switching locomotive utilizing a small diesel engine and a large bank of rechargeable batteries. Switching locomotives are of particular concern as they typically operate in a limited area, often in or near urban centers, and spend much of their time idling. Both designs reduce pollution below EPA Tier II standards and cut or eliminate emissions during idle. ↑ Diesel, Rudolf. U.S. Patent No. 608,845, filed July 15, 1895, and issued August 9, 1898 Accessed via Google Patent Search at: US Patent #608,845 on February 8, 2007. ↑ Churella 1998, p. 15. 1 2 Stover, John F. (1997). American Railroads. Chicago, Illinois: The University of Chicago Press. p. 212. ISBN 978-0-226-77658-3. ↑ Edison, Thomas A. U.S. Patent No. 493,425, filed January 19, 1891, and issued March 14, 1891 Accessed via the Edison Papers at: US Patent #493,425 on February 8, 2007. ↑ Churella 1998, pp. 28-30. ↑ Churella 1998, pp. 25-27. ↑ Pinkepank 1973, p. 209–211. ↑ Pinkepank 1973, p. 283. ↑ Churella 1998, p. 27. ↑ Wendel, C.H. (1987). Power in the Past, Vol. 2; A History of Fairbanks-Morse and Co., Stemgas Publishing Company, 1982. ↑ Churella 1998, p. 10. ↑ Churella 1998, p. 19. ↑ http://www.sdrm.org/faqs/hostling.html, Phil Jern "How to Boot a Steam Locomotive" (1990) San Diego Railroad Museum. ↑ SmartStart® IIe - Automatic Engine Start/Stop System. Ztr.com. Retrieved on 2013-08-16. ↑ Churella 1998, pp. 12-17. ↑ Churella 1998, p. 14. ↑ Marre, Louis A. (1995). Diesel Locomotives: The First Fifty Years. Waukesha, Wis., USA: Kalmbach. pp. 384–385. ISBN 0-89024-258-5. ↑ "A German Diesel-Pneumatic Locomotive". Douglas-self.com. Retrieved 2011-08-20. ↑ "Development of the Flameproof Diesel Vehicle Applied New Exhaust Gas Dry Type Treatment System". Sciencelinks.jp. 2009-03-18. Retrieved 2011-08-20. ↑ King, Joe (2008-09-22). "Engineering gets $1 million grant to make locomotives leaner, greener". Northern Illinois University. Retrieved 2011-08-06. ↑ Eilperin, Juliet (2006-08-14). "Attention to Locomotives' Emissions Renewed". Washington Post. Retrieved 2011-08-06. ↑ Hawthorne, Michael (February 14, 2011). "Metra finds 'alarming' pollution on some trains". Chicago Tribune. Retrieved 2011-08-06. ↑ Wilkins, Davell (2011-04-13). "Study: Installed Traps In Diesel Engines Reduce Pollution Levels". Top News. Retrieved 2011-08-06. ↑ "Pollution on Metra Trains Worse Than Thought: Report". Fox Chicago News. 2011-02-14. Retrieved 2011-08-06. ↑ Lydersen, Kari (April 21, 2011). "Black Carbon Testing Finds High Levels". The New York Times. Retrieved August 6, 2011. ↑ "Multi-Engine GenSet Ultra Low Emissions Road-Switcher Locomotive" (PDF). National Railway Equipment Company. Retrieved 2012-06-03. ↑ "Railpower Technologies Products". Archived from the original on January 14, 2008. Retrieved 2012-06-03. ↑ RJ Corman Railpower Genset & Hybrid Switchers. Trainweb.org. Retrieved on 2013-08-16. Churella, Albert J. (1998). From Steam to Diesel: Managerial Customs and Organizational Capabilities in the Twentieth-Century American Locomotive Industry. Princeton, New Jersey: Princeton University Press. ISBN 0-691-02776-5. Pinkepank, Jerry A. (1973). The Second Diesel Spotter’s Guide. Milwaukee WI: Kalmbach Books. ISBN 0-89024-026-4.